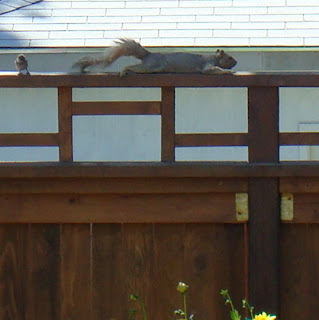 Squash House Quilts: New Gadget and a Squirrel in a Pickle! A while back I got a new attachment for my Bernina Walking Foot. It's a little guide to help keep your stitches in the ditch. You may be wondering why I still quilt on my Bernina when I now have a longarm? There are still a lot of small things I make which are much easier to do on the Bernina rather than waste backing fabric trying to load something small on the longarm. Yesterday afternoon I decided to give it a whirl. I can't tell you what this is, but it is part of a Christmas project I'm making. If you enlarge the photo you'll see this better. Check the blue arrow that points to the "blade". 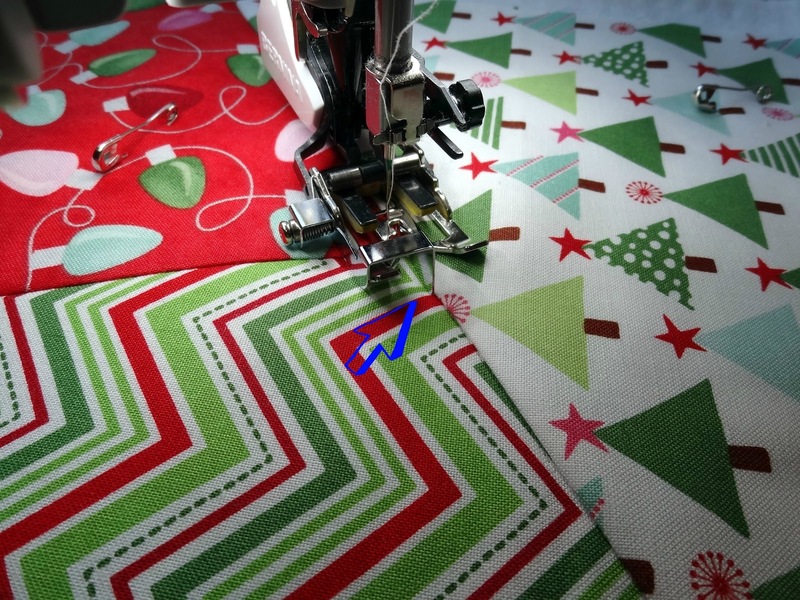 As long as you keep this blade in the ditch while you stitch, your stitching will never show! I took this photo a while back. The bird seems to be recoiling possibly from the reason Mr. Squirrel is lifting his tail, or he's scheming up a way to surprise Mr. Squirrel! That looks like a very handy attachment - it's always hard to keep those stitches in the ditch, where they belong. Mr. Squirrel is way too funny! I love my Bernina walking foot guide! Doesn't the stitch in the ditch thing work like a charm with it? Love it. I have such a foot for my Janome but your Bernina in the ditch foot gives truly amazing results. Squirrels are very entertaining. We have a backyard full! Love the fabrics in your ditch project! Looking wonderful. 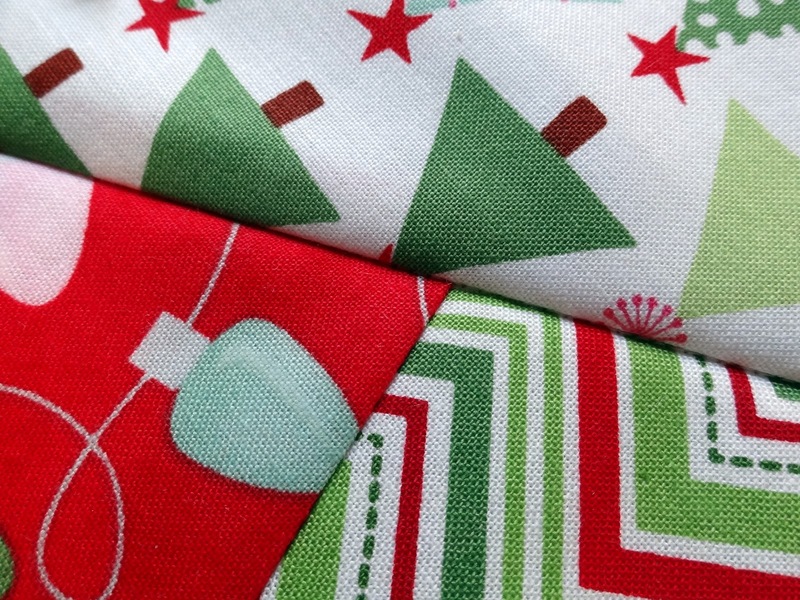 I have seen other longarmer's blogs where they do several tablerunners at once on the same backing piece--so clever! I'd think that squirrel's tail appears to be the object of the bird's wariness. Those things can go wacko! Just love your walking foot ! What a great idea !! That walking foot looks handy! I must find out if Husqvarna has something similar. Ohhh, fancy that attachment! What does something like that cost? I could possibly be near a Bernina dealer tomorrow. Nifty tool for our "Ninas" ..i will have to check into that though I almost never use my domestic for quilting. If I don't do them on the Gammill I do them by hand. Where did you find this little treasure? It is a nice tool. I tried at our quilt shop and the stitches were hidden. Have a great weekend, Candace! I saw some of that fabric in a quilt store today. I like the trees. It reminds me of wrapping paper. That squirrel cracks me up. Hi Candace-- Found my way here via Stephanie! Enjoyed catching up with your blog!